Note: The following page contains information on Boston CAL 133 and TB 133 fire code. It is not intended to serve as policy. For more information on CAL 133, see below to view the guidelines from the California Bureau of Electronic and Appliance Repair, Home Furnishings and Thermal Insulation. CAL 133 or TB 133 is a fire regulation that regulates upholstered furniture and any other upholstery within a commercial setting. Typically, this code is what restaurants, hotels and other public-areas in commercial buildings need to adhere to, including restaurants, which per the code, are required to have CAL 133 Restaurant Booths and Banquettes installed. At Furniture Concepts, we are Boston CAL 133 specialists, and have fabricated millions of dollars worth of Boston CAL 133 furniture since our launch in 1994. Every year, interior design, general contractors and restaurant owners trust Furniture Concepts with providing them the best-build CAL 133 restaurant booths and banquettes on the market today. CAL 133 is the code enforced by the City of Boston for public-area settings where more than 49 people assemble. However, if the location does not have a sprinkler system installed, the building may still need to adhere to CAL 133 regardless of assembly size. To see if your project needs to adhere to CAL 133, we recommend contacting the Boston Fire Department, or the local fire department in your community. There are other cities and towns, outside of Boston proper, that may also require CAL 133 furniture and upholstery. The code’s main objective is contain the flame of a potential fire. 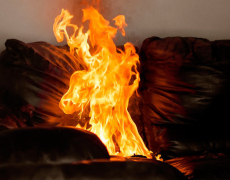 The standard foams and fabrics used in typical furniture is highly flammable. The code requires an upholstery process and material that helps contain the spread of an open flame. If CAL 133 is the mandated code in your area, and you do not adhere to that code with your upholstery products, you run the risk of an insurance company not covering a claim, or other potential legal threats, if the worst-case scenario happened and a fire broke out in your facility. In order for a piece of furniture to comply with CAL 133, a full-scale burn test must be executed and those results provided to the fire department for approval. At Furniture Concepts, we have had CAL 133 Restaurant Booths and Banquettes tested with approved test results, conducted by independent laboratories. A piece of furniture is placed in a test room and ignited, where the lab measures temperature, smoke, flame height, the amount of carbon monoxide generated and other factors, which are then compared to CAL 133 criteria to establish compliance or non-compliance. In order to meet the CAL 133 requirements, our upholsterers at Furniture Concepts need to upholster pieces in a particular manner, including using barrier products that prevent flames from spreading. In order to meet the strictest requirements in the country, all of our commercial furniture at Furniture Concepts meets CAL 133 requirements. All furniture that meets code must also be labeled to show compliance, but oftentimes a permit is required by the local fire department, where they will review full-scale burn tests as well as fabric flame information. All of our CAL 133 Restaurant Booths and Banquettes at Furniture Concepts have this label adhered to the bottom of the piece. CAL 133 was originated in California, but other states have begun to adopt its guidelines, as its currently the strictest in the nation, and many other cities and towns in the U.S. are requiring CAL 133 Restaurant Booths and Banquettes in food-service settings. We recommend checking with your local fire department before beginning your project to determine if this is a need. For more information on CAL 133, click here to view the guidelines from the California Bureau of Electronic and Appliance Repair, Home Furnishings and Thermal Insulation.